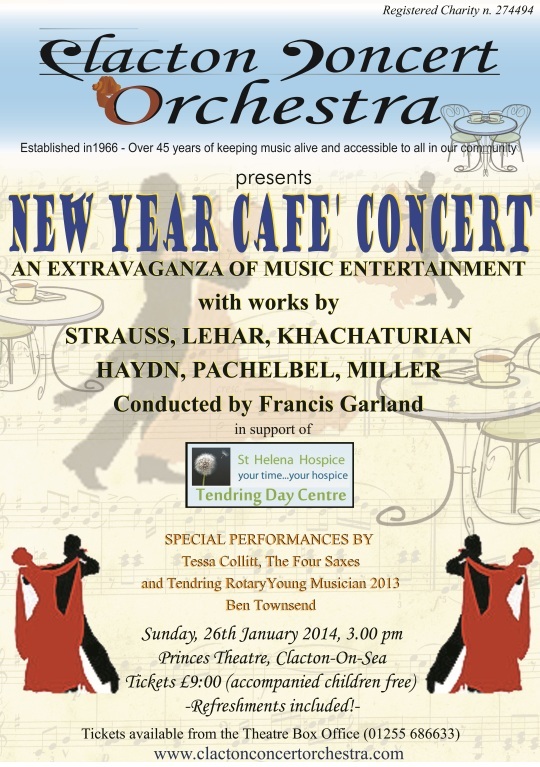 A perfect way to warm away those winter chills – come and join Clacton Concert Orchestra at their New Year Cafe concert to be held at the Princes Theatre, Clacton on Sea at 3pm on Sunday 26thJanuary 2014. Imagine the scene: large round tables with crisp white cloths, tea and coffee in abundance with cakes and biscuits, walk around, enjoy the informality. Picture the Orchestra under multi-talented young conductor Francis Garland and leader Ruth Baker. Dance if the mood takes you, there will be Strauss, Lehar and other Viennese delights. Tap your feet to the “Four Saxes” – the foot tapping may lead to dancing! Listen to the beautiful singing of Tessa Collitt who will perform Vilja from the Merry Widow and the choruses from The Blue Danube Waltz. Experience a delight for your ears with flutist Julie Harmer who will display her considerable talent playing Doppler’s Flute Concerto. CCO are delighted to welcome guitarist Ben Townsend, the 2013 winner of the prestigious Tendring Rotary Young Musician Competition, who will perform with the Strings section of the orchestra his amazing interpretation of Pachelbel’s Canon. The whole afternoon is a feast for the eyes, ears, feet, and don’t forget the ample refreshments. You will also be supporting St Helena’s Hospice Tendring Day Centre who will be the recipients of the proceeds from the concert.